Hello everybody! 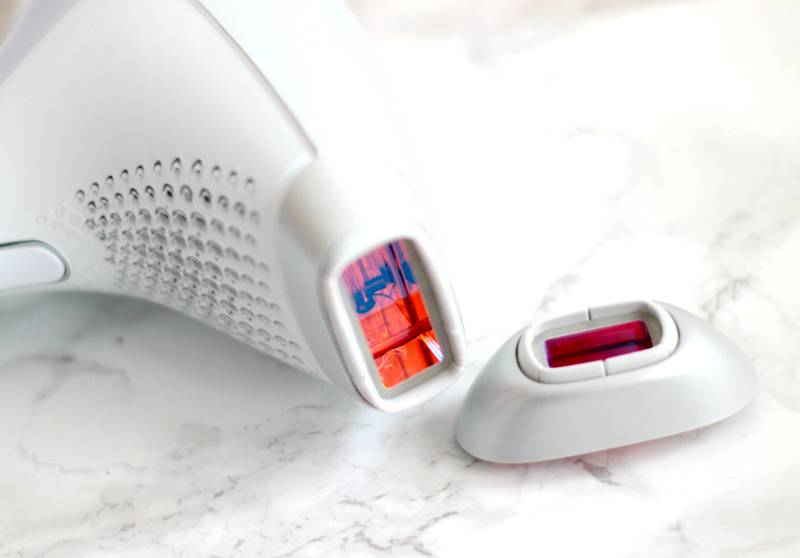 I know this post has been highly anticipated by those of you who were curious about the Philips Lumea, however if you missed my original post and have no idea about what I'm talking about, I'd recommend you click here before continuing! Also if you don't have a lot of time and simply want to know 'So far do you recommend this?' my answer is YES. YES I DO. But do read on for my full experience thus far! Having said that, I have discovered a wonder product and if any of you also suffer from razor burns and in-grown hairs, you really need to get a bottle of this in your life. 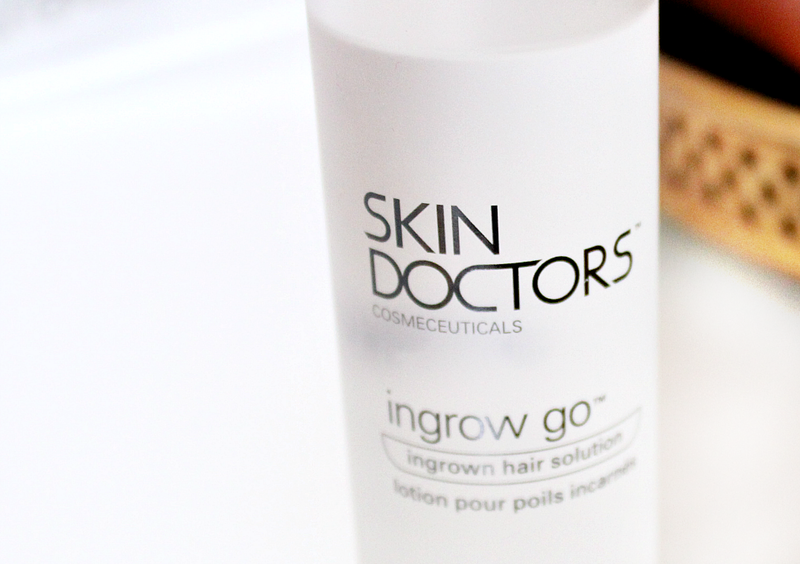 It's the Skin Doctors ingrow go (link) which works incredibly well if used consistently. The only downside to this product is the very strong smell, however the results it gives are well worth it to me. I shave my skin, use the lumea and then after a couple of hours I apply the lotion using a cotton pad, over any bumps or ingrowns in the evening. Although it's called a lotion, it's very much a liquid just a heads up. I then follow up the area in the morning, unless I'm heading straight out because like I mentioned, the smell be strong. One thing to note is this product works as an exfoliator, due to the AHAs. However you're supposed to avoid AHAs whilst using the Lumea because both AHAs and the laser light from the Lumea cause skin to become more sensitive to the sun. I don't show my arms and legs anyways, so I use it liberally over these areas, however I do not use this on my face at all. To be on the safe side and not over-sensitise my skin, I only apply this twice a day, for 3-4 days after shaving and then my skin gets over a weeks break, before I use the IPL again. I hope this is enough protection, it seems to be working well and it really does clear up redness, irritation and ingrowns faster than any other natural method I tried! I think I probably would have stopped the whole shaving process by now, had I have not found this stuff, it's amaaaazing! I'm using the lumea pretty much all over the areas that I want to reduce hair growth, and hopefully have at least 60-70% gone for good. Remember NO hair removal method will keep you hair free permanently, even salon laser hair removal will still requite touchups. So I have split it up over two days, every other Tuesday I do face and arms and every other Thursday I do under arms and legs. To be honest I wish I had started off doing underarms on a Tuesday too since they're quite a small area. I have long legs and I definitely don't have a thigh gap lol! So my legs take a while, I usually start my YouTube playlist and I'll have watched about an hour and a bit of videos by the time I've finished. I also have to ensure it's been fully charged before starting my legs, or I have to take a break and pop it on charge which is kind of frustrating. Also I picked up a couple of these eyebrow razors from Ebay, this is the only type of razor I'd ever recommend using on the face ALTHOUGH, these ones in particular are not the best. 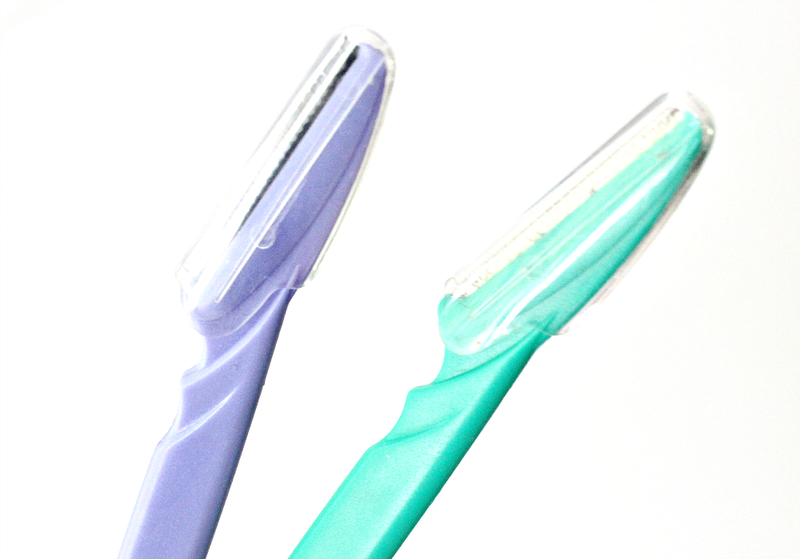 It takes a while to get used to them and a couple more strokes on the same spot, compared to a razor which is slightly sharper. You get a lot in the pack and it's quick enough to wiz this around finer facial hair. I bought this pack, for two quid. I'm technically half way through my treatment, or just over half anyway, as they suggest 4-5 fortnightly treatments are what makes up the initial treatment. Pretty much nothing, the hair regrew and didn't fall out which is exactly what I expected. The first place I noticed the lumea working was on my arms, after I got used to the feeling of hair growing back stubbly, I saw little bald patches in-between the hair that regrew! It was quite funny actually, the patches were only about 7mm if that but there was definitely baldness on my arms. This was a week after the second treatment. In other areas I didn't notice bald patches, however by this point hair regrowth has definitely slowed down, especially considering I was shaving and not taking hair out by the root. My skin also seemed to get used to the shaving process and it's become less painful (still not ideal) but do-able. Again hair regrowth has been a lot slower and I noticed tiny tiny bald patches on all areas that I'm using the lumea on. However my arms and legs have bigger bald patches because firstly I use the larger attachment and secondly I've started using level 4-5 on those areas so the intensity is definitely making a difference. Of course with level five there is a stronger sensation, not exactly pain but more like an 'oof!' at each zap and then it's over. The funniest thing for me was noticing stripes of hair on my thighs, where clearly I had not gone over with the laser two weeks previously. This is why they say you should use a white pencil, but like I said my legs are just too big/long for me to bother with that. Instead of using a pencil, I'll be more vigilant with covering the whole area. But at least seeing the clear distinction showed me that it was actually working. I wish I had seen more of an improvement on my arms, I'd say about 30% of my areas were hair free before shaving for the fourth time. Finger's crossed I'll see more of a difference from this point onwards! The same with my underarms, very tiny amount of bald patches but definitely slower regrowth which is encouraging for sure. As for my face I've only really seen a difference in the last two weeks, because the facial attachment does have an extra filter for the protection so the impact is slower. On my upper lip, 50% of the hair is no longer growing back and sideburns 30%. So just to round up my thoughts thusfar, I'm glad to see how slow hair regrowth has become and the bald patches are really (weirdly) exciting haha! I'll do another update after my fifth treatment, I did my fourth this week, so you can expect to see that on the second week of June! I'm hoping to see more rapid changes in the next couple of weeks, mainly because of how many times I'll have repeated the treatment. However if I don't see more of a change in the next two weeks, I'll probably continue using the lumea every week for a month because I've read that for some people weekly initial treatments work more effectively than fortnightly. We shall see. 1. Did you have any breakouts with it? No thank-goodness I didn't have any breakouts! 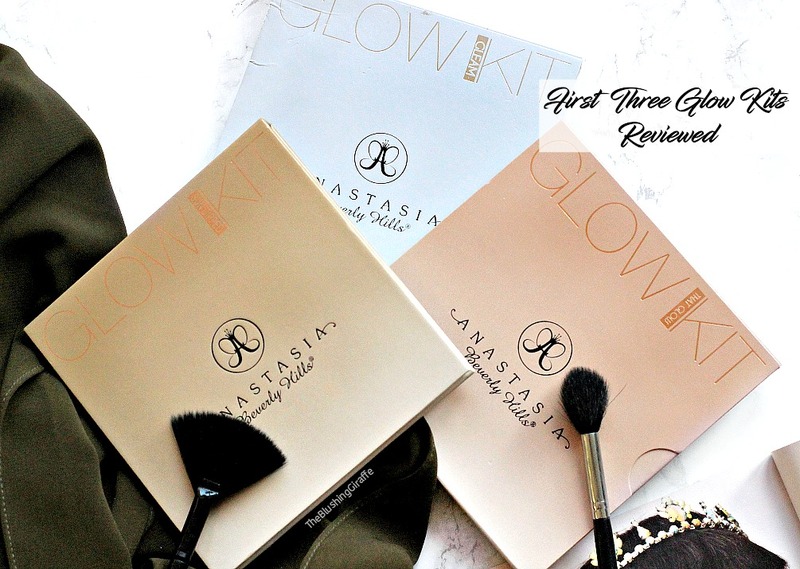 I always use it on no-makeup days or in the evening so my skin can breathe on my face. I also don't apply a lot of products on straight after because I feel like my skin is more sensitive so I let it rest. I should mention here that two people said they did break out after using this - everyone's skin is different and it's important to be aware of this, although before purchasing it I read numerous reviews and I didn't see anyone else saying they'd experienced breakouts (I think that would have put me off!). Regardless I did want to mention it here as if you have severely sensitive skin, keep this in mind. 2. Does it change the colour of your face? It hasn't changed the colour of my face itself but I feel like removing the hair on my upper lip and sideburns has meant my face looks more even in tone. This is because the colour of skin, with a light layer of dark hair over it, does look darker and sometimes it can even look a little green which is horrid (especially on the upper lip). So it's been really nice to have a more even complexion! That's one of the main reasons why this whole shaving of the face trend started but I feel much better knowing that I'm using IPL over the area, rather than just letting it grow back stubbly (because trust me, hair on the side burn areas WILL defo grow back prickly on the face if shaved). 3. Do you have to shave the sides of your face? Yes but only if you want to treat that area! Trust me it's not as scary as it sounds, plus there are tonnes of tutorials on how to do it with the same razor I recommend. 4. how long before you see the difference in hair growth? You see hair growth slowing down within two treatments...well I did anyways! 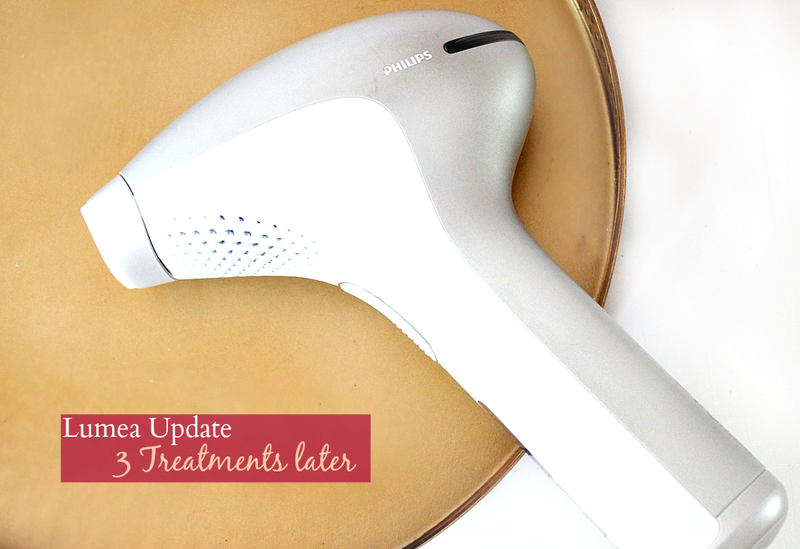 I think the recommended treatment phase generally works for most people, but you can of course adjust it to your own results/body...but do remember the lumea isn't designed to get rid of hair 100%. 5. Did it burn your skin or cause any scarring/hyper-pigmentation? It doesn't burn the skin, however on the third time I used it on a level 5 on my face and my skin was red and sore for a couple of hours after that. I could also really feel the effect of the laser on my face, so I've decided to stick to the level 4 from now onwards! Nope, no hyper pigmentation - if anything my skin looks clearer and feels a whole lot smoother in that area. 6. Has it changed the condition of your skin? Have you noticed reduction in hair. Has your hair grown back since? The condition of my skin is the same, it just feels smoother but I think that's more to do with the hair removal than the actual IPL (although using the IPL obviously means the hair growth will be slowed down and reduced). Yes the reduction of hair has been slow but steady so far and yes hair has to grow back, but then it falls out naturally. This is how it works, until the majority of the hair has fallen out. 7. Have you noticed any sensitivity on your skin? Would you recommend it for spot prone skin? Does it completely illuminate hair growth or reduce the speed of growth? My skin is only sensitive straight after and for the next hour or so. I still wouldn't recommend zapping before applying makeup though. Spot prone skin should be fine, just ensure you're always using the face window not the body window and start on a lower setting. It's purpose is to reduce hair growth and the way it works is it majorly slows it down, so you have the initial treatments every other week and then once a month you just go over the areas and the majority of hair should be removed. I've read people ahve gotten rid of between 60-90% of hair for the most part and there's really no way of telling what percentage of hair it will rid for me or you, but as I said in my first post, if a large percentage of my body hair stops growing for the price of this I'll be happy! Thanks for reading such a long post everyone! If you have any other questions feel free to leave them in the comments and I'll address them soon/in the next update.